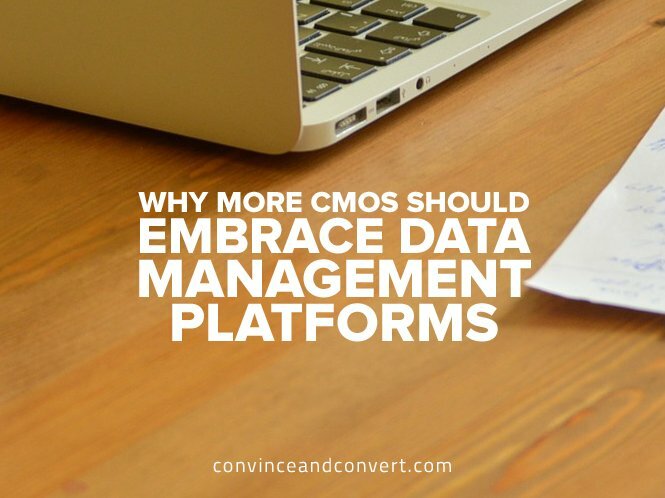 Not as good as the original, but the point is that CMOs—and, frankly, all marketers today—need to realize the importance of utilizing a data management platform, or DMP. I am most assuredly invoking logic when it comes to the need for a DMP, especially given the results of a recent survey conducted by Forbes Insights and Axiom, which revealed that only 27 percent of executives at large, US-based firms are highly satisfied with their organization’s ability to extract value from data. That means 75 percent are dissatisfied with their organization’s ability to extract value from data—in other words, the needs of the many outweigh the needs of the few. Another finding revealed that just 40 percent of surveyed executives believe their data is highly accurate. What makes the need for a DMP even more glaring is that nearly 50 percent of respondents said they believe digital-savvy consumers will be highly influential in shaping the marketing industry (“digital-savvy” meaning they generate a lot of data). A data management platform provides marketers with centralized control of all of their audience and campaign data. It helps them manage and analyze this data to craft, target, and optimize campaigns that reach more of the right people and drive improved ROI. You want to manage multiple online campaigns across different devices. You need to connect all of your data—known or anonymous, online or offline, deterministic or probabilistic, user level or household—to a single individual. You want to maximize your data assets. You want to maximize segmentation and scale campaigns. You need to prevent data leakage with partners. You need to prepare for programmatic future. You want to optimize campaigns to improve response rates, conversion, and brand recognition. You want to control advertising costs and improve overall ROI. You want to and need to hold your marketing and advertising accountable. A data management platform and data-driven marketing are here to enable accountability. The more you know about your customers and prospects, the more precisely you can target and market. It sounds simple, but add one more piece to this: With all the data available to marketers, if you approach this with an eye towards generating revenue, you can actually cut marketing costs by reducing waste and dramatically improving your ROI.